Turkey season is upon us (April 13-May 5 in Kentucky). For the occasion, let’s look at a few fascinating facts and the sometimes-strange behavior of the wild turkey, Meleagris gallopavo. Is it true that Ben Franklin officially proposed that the wild turkey become our national symbol? No, but he liked the idea of it, not because of the bird’s patriotically colored head—red, white and blue—rather, he respected its courage. But, more about that later. The colors on the turkey’s head can change in an instant with different emotions, becoming pink or almost all white. Wild turkeys have a complex language as well, which includes assembly calls, yelps, purrs, cutts, clucks and fly-up and fly-down cackles. And there is the male gobble, used to let females know he’s nearby. When he comes within sight of a female, sporting his beard, he struts his stuff by spreading his massive tail feathers. Turkey hunters like to imitate the language of the turkey and some folks are very good at it. The National Wild Turkey Federation sponsors the annual Grand National Calling Championships. In 2018, a Kentuckian, Jessie Martin of Mt. Sterling, won the head-to-head competition. Turkeys feed on insects, nuts, seeds, berries and the occasional lizard or frog. To spot food or predators, turkeys use their excellent vision, including great color vision. That’s why turkey hunters go to extraordinary lengths to camouflage themselves, some even wearing camouflage face makeup. Remember Ben Franklin’s respect for the courage of the wild turkey? These winged behemoths, armed with sharp beaks and knife-like claws, are so courageous they will even chase and attack humans, usually in neighborhoods where hunting is prohibited. Some people like to feed turkeys when they show up in their backyards, and that’s where the trouble begins. Wild turkeys don’t look at these accommodating humans with the same degree of friendliness. They may eat the food you toss to them, but at the same time they’re deciding whether or not to take you down. They can run up to 25 mph and reach flight speeds of 55 mph. When you try to run away from them it can be like a scene from the Alfred Hitchcock horror movie The Birds. I’ve got a little secret for the frightened people who get chased and attacked by turkeys: If you turn around and run toward them, they will run from you. It’s all about dominance. Most importantly, don’t feed them in the first place. These are just a few facts about our beloved wild turkey, revered by Ben Franklin and feared by unsuspecting humans. You may want to thank a turkey hunter this spring for being out there on the front lines. 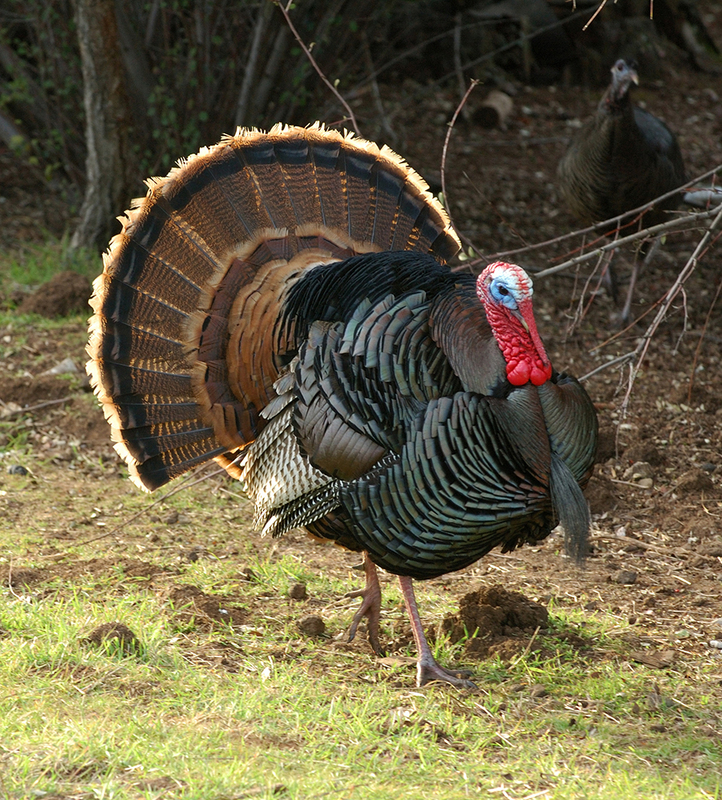 For more about wild turkeys or turkey hunting, visit www.nwtf.org or www.fw.ky.gov.